Quanta bring to you the 2-Socket high availability system you've been looking for your business, the Stratos S210-X22RQ. The refurbished Stratos S210-X22RQ is a rackmount server optimised for memcached, Data Analysis and Storage, Virtulization / Hypervisors and cloud computing. The dual-socket refurbished Quanta server features up to two E5-2600 V1 / V2 processors with a maximum of 24-cores per chassis. 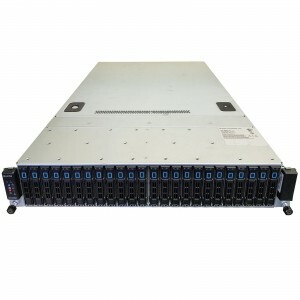 Supporting up to 768GB of DDR3 LRDIMM memory and the capacity for up to twelve 3.5” or twenty four 2.5” hot-swappable SAS or SATA, SSD or HDD drives this is the ideal refurbished rackmount server for complex and demanding workloads. 4x PCIe Gen3 expansion slots and 2x mezzanine slots provide you with all the network expansion your business could need. Reliability is always a concern when buying a server and the Quanta Stratos has you covered. With redundant, hot-plug PSUs and fans the refurbished Quanta ensures that maximum up-time is achieved. Remote management via IPMI V2.0 and "KVM-over-IP" ensures that management of the rackmount server is simple. Only at Bargain Hardware can you configure every aspect of this refurbished Quanta Stratos S210-X22RQ to meet your price and performance requirements. From SAS & SATA Drives to an array of Processors and PCIe expansion cards, every option is available to customize your system for any task.